It is adaptable and can be configured for more advanced systems, depending on customer's needs, including laser-guided ordinance, sensors, and fire-control systems. Image courtesy of Greg Goebel. The Air Tractor AT-802U aircraft can carry Mk-82 bombs, as well as Hellfire missiles, dual M260 seven-tube rocket launchers, and GAU-19/A three-barrel gatling guns. Image courtesy of Cliff. 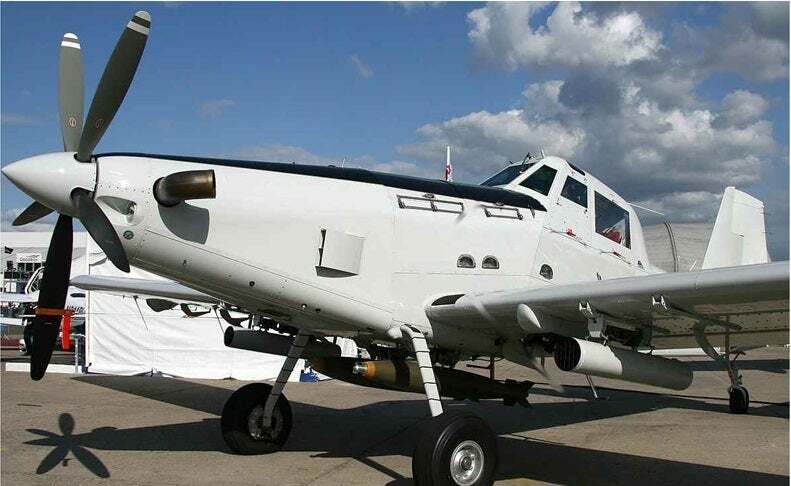 The AT-802U surveillance and light-attack aircraft is a heavily armoured version of the AT-802 agricultural and fire fighting aircraft, developed by Air Tractor. It is capable of performing ten-hour missions while carrying 3,629kg payload, which makes the AT-802U an ideal platform for surveillance and light-attack missions. The multimission aircraft is deployed in intelligence, surveillance and reconnaissance (ISR), precision-strike, command and control, counter-insurgency (COIN), close-air support, weapons training, forward arming and refuelling point missions. The aircraft is undergoing a new weapons certification process, as its IOMAX mission systems have been replaced with new systems from L-3 Communications. The AT-802U is also configurable for more advanced systems depending on customer requirements. Laser-guided ordnance, helmet-mounted displays, fire-control systems, survivability systems, and sensor payloads could all be incorporated into this robust aircraft. The aircraft offers sufficient fuselage and wing space for installing sensors and data-links. The spring-steel landing gear along with high-dust environment air induction system allows missions from unimproved airstrips and dirt roads. The aircraft has a wingspan of 18m and wing area of 37.25m². Its empty weight with armour and without weapons is 3,703kg, and the useful load is 4,000kg when attached with ballistic armour. The AT-802U integrates a tandem seat cockpit, which includes dual-flight controls, head-up displays (HUD), an electronic flight instrumentation system, a Wulfsberg Flexcomm tactical modular multi-band airborne FM/AM/UHF radio communications system, and a retractable L3 Wescam MX-15Di sensor turret system. The optionally-fitted compact multichannel data link (CMDL) system is compatible with remotely operated video-enhanced receivers (ROVER). It provides the commanders a real-time view of the battlefield and also transmits live video feed to other aircraft, air operation centres, or joint-terminal attack controllers on field. The night-vision-compatible cockpit allows the pilots to conduct unconstrained night missions. The aircraft also features an inflatable restraint system, which integrates a five-point harness. The wing and fuselage hard points can be armed with a range of weapon systems, including dual .50 cal. GAU-19/A three-barrel gatling guns, Hellfire missiles, dual M260 seven-tube rocket launchers, and 500lb Mk-82 bombs. The hard points can be increased to 15 to carry additional armament. "The AT-802U aircraft offers higher speed and manoeuvrability than most helicopters, UAVs and cargo aircraft." The armament aboard the aircraft can be launched with a high level of accuracy to minimise collateral damage. The aircraft features a crashworthy airframe, cockpit and engine armour, ballistic glass windshields and windows, as well as self-sealing fuel tanks, to offer superior protection to its crew members. The survivability can be further increased by installing an optional AAR-47/ALE-47 survivability system. The field-repairable defensive armour enables the aircraft to withstand multiple bullet hits and can also be upgraded to defeat high threat levels. The aircraft is powered by a Pratt & Whitney PT6A-67F turboprop engine driving a Hartzell aluminium propeller. The engine develops a maximum continuous power of 1,600shp at 1,700rpm. The fuel capacity of the aircraft is 1,438l, which can be increased by adding auxiliary fuel tanks. The AT-802U aircraft offers higher speed and manoeuvrability than most helicopters, UAVs and cargo aircraft. It has a maximum speed of 394km/h and stall speed of 169km/h with flaps down. The patrol speed of the aircraft is 333km/h, and the maximum range is 2,414km when fitted with auxiliary fuel tanks. The aircraft can climb at a maximum rate of 3,000ft/m, and requires a landing run of 366m, and a minimum take-off roll of 207m. It can perform 450 flight hours a year, at an average cost of below $400 per flight hour.